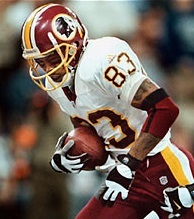 The Washington Redskins had a 2-1 record, but had not yet won at home, as they hosted the Carolina Panthers on October 3, 1999. Washington had a new owner in Daniel M. Snyder but Norv Turner was back for a sixth season as head coach. Only two of those years had yielded winning records, and they were 6-10 in 1998. There was a new starting quarterback in Brad Johnson (pictured above), obtained from the Vikings, and he was off to a good start with five TDs and no interceptions among his first 89 passes. RB Stephen Davis was over a hundred yards in two of the first three games and gained 93 the previous week, with a total of eight touchdowns scored while playing behind an improved line. The biggest concern was the defense, which had shown a tendency to give up significant yardage. Carolina was at 1-2 under first-year Head Coach George Seifert, twice a NFL title winner with the 49ers, and had just won for the first time a week before. Conservative offensively in their first four years, the Panthers were now more willing to go to the air with QB Steve Beuerlein. RB Tshimanga “Tim” Biakabutuka provided breakaway speed when healthy. But like the Redskins, they had concerns regarding the defense. There were 76,831 fans in attendance at Redskins Stadium. The teams exchanged punts to start the game before the Panthers struck quickly on the third play of their second series. Tim Biakabutuka (pictured below) ran around end for a 60-yard touchdown, John Kasay kicked the extra point, and the visitors were in front by 7-0. Carolina got the ball back in short order when RB Brian Mitchell fumbled the kickoff return and CB Michael Swift recovered at the Washington 28. Steve Beuerlein immediately threw to WR Muhsin Muhammad for a 27-yard gain to the one and, two plays later, Biakabutuka scored from that distance for his second TD. With Kasay’s point after, the Panthers were up by 14-0 and the game was barely five minutes old. The Redskins had to punt following their next series and Carolina took just two plays to cover 60 yards. Beuerlein threw to Muhammad for 15 yards and then it was Biakabutuka running up the middle for a 45-yard TD, his third of the game. Kasay again converted and Carolina was ahead by a formidable 21-0, still in the opening period. Washington responded with a long drive of 14 plays that covered 78 yards and extended into the second quarter. Brad Johnson completed five passes, three of them to FB Larry Centers, the longest of which covered 19 yards. Stephen Davis ran effectively, as did Brian Mitchell, who gained nine yards on a third-and-three play, and it was Davis running for a one-yard touchdown to get the home team on the scoreboard. Brett Conway added the PAT. On the first play of Carolina’s next possession, Beuerlein connected with WR Rae Carruth for 43 yards to the Washington 35. The Panthers picked up another ten yards before the drive stalled and Kasay kicked a 43-yard field goal to give the visitors a 24-7 advantage. The Redskins responded with a big first down play of their own as Johnson passed to WR Michael Westbrook (pictured below), who broke away from CB Eric Davis on a 47-yard gain to the Carolina 33. Three plays later, Johnson went to Westbrook again for a 17-yard TD and Conway added the extra point. A short possession by the Panthers ended with a punt and the Redskins picked up 37 yards on a pass interference penalty on CB Doug Evans. Runs by Johnson and Davis advanced Washington to the Carolina eight, but a loss on a running play and incomplete pass had the home team facing a third-and-11 situation. Once again it was Johnson to Westbrook for a touchdown. Conway’s extra point made it a three-point margin of 24-21 with 6:51 to go in the first half. The Panthers had to punt again and it didn’t take the Redskins long to reach the end zone. On the next play Johnson threw to WR Albert Connell for a 62-yard TD and, adding Conway’s point after, the Redskins were in front by 28-24 at halftime. The 28 points in a single quarter set a club record. The teams traded punts to start the third quarter before the Redskins added to their lead. It took just four plays to travel 60 yards as Johnson completed passes to Connell for nine yards and Westbrook for 16, with a three-yard run by Davis in between. Johnson’s third pass of the series was to Connell for a 32-yard touchdown and, with Conway’s conversion, the home team was now up by 35-24. The Panthers drove into Washington territory on the next possession as Beuerlein completed three passes and Biakabutuka had a 16-yard run. But the drive stalled at the 34 as three straight throws fell incomplete and Kasay missed on a 52-yard field goal attempt. 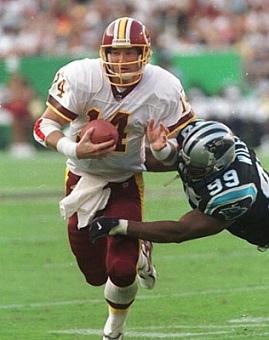 The Redskins reached the Carolina 35 on their next series, but attempting to convert a fourth-and-five situation, Johnson was sacked by LB Michael Barrow. 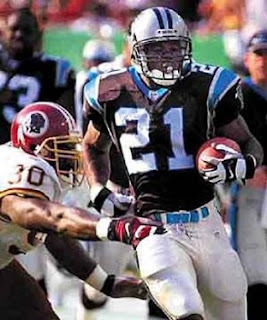 Beuerlein immediately threw to Muhammad for a 31-yard gain but the Panthers were backed up by a holding penalty, and while they got the ten yards back, they ended up with a Kasay field goal from 43 yards to narrow Washington’s lead to 35-27. The Redskins punted on their next possession and the Panthers started off the fourth quarter with the ball at midfield. Beuerlein completed three passes and the visitors came away with another field goal by Kasay, this time from 42 yards, to make it a 35-30 tally. Washington went three-and-out and the Redskins punted again from deep in their own territory. Taking over at the Washington 47, the Panthers took six plays to score. Beuerlein converted a third-and-ten situation with a pass to WR Patrick Jeffers that picked up 13 yards and a throw to Muhammad gained 31 yards. TE Wesley Walls caught a six-yard TD pass, and while the try for two points failed, Carolina was back on top by 36-35 with 10:28 to play. The teams exchanged punts once more and the clock was down to 4:19 as the Redskins took over at their 19, and after Coach Turner successfully challenged a ruling that Mitchell had fumbled the ball away on his punt return. Johnson threw to Westbrook for nine yards and Davis ran for 12, but four plays later Washington was facing fourth-and-one. Davis kept the drive alive with a three-yard run and Johnson completed a pass to WR Irving Fryar for 16 yards to the Carolina 32. Two plays after that, Johnson threw to Westbrook for 19 yards and, after two runs into the line, Conway came on to kick a 31-yard field goal with six seconds to play. Washington won by a final score of 38-36. Carolina outgained the Redskins (483 yards to 418) and had the edge in first downs (23 to 22) although Washington had the longer time of possession (31:40 to 28:20). The teams were close in net passing yards with the Panthers leading by 328 to 308, and the visitors gained 155 yards on the ground, to 110 for the Redskins. Each team turned the ball over once. Brad Johnson completed 20 of 33 passes for 337 yards and four touchdowns while giving up no interceptions. Michael Westbrook had 8 catches for 140 yards and two TDs and Albert Connell (pictured at right) had five receptions for 134 yards and two scores as well. Stephen Davis topped Washington’s rushers with 72 yards on 21 carries that included a TD. For the Panthers, Steve Beuerlein was successful 23 of 47 throws for 334 yards and a TD while giving up an interception. Tim Biakabutuka ran for 142 yards on 12 carries that included three touchdowns, with 123 of those yards and all of the scores coming in the first quarter. Muhsin Muhammad caught 8 passes for 151 yards. The Redskins raised their record to 3-1 and, while they slumped at midseason, they went on to top the NFC East at 10-6 and reach the postseason for the first time since 1992. Washington defeated Detroit in the Wild Card round before falling to Tampa Bay at the Divisional level. The Panthers finished at 8-8, which was an improvement for them after consecutive losing years in 1997 and ’98. That placed Carolina second in the NFC West. Brad Johnson and Steve Beuerlein remained among the leaders in most passing categories, with Beuerlein topping the NFL in pass completions (343) and yards (4436) and ranking second to Kurt Warner of the Rams in TD passes (36) and passer rating (94.6). However, the immobile Beuerlein also ranked first in the NFC in being sacked (50). Johnson placed fifth in pass attempts (519), completions (316), yards (4005), yards per attempt (7.7), and passer rating (90.0), and was third in completion percentage (60.9) and tied for fourth with Oakland’s Rich Gannon in touchdown passes (24). Michael Westbrook and Albert Connell remained an effective receiving tandem, with Westbrook catching 65 passes for 1191 yards (18.3 avg.) and nine touchdowns and Connell accounting for 62 receptions for 1132 yards (18.3 avg. also) and seven TDs. The totals all represented career highs for both receivers (although Connell averaged 19.5 yards on 39 catches in 2000). Tim Biakabutuka characteristically missed five games and rushed for a career-best 718 yards on 138 carries (5.2 avg.) and six touchdowns. As the game against the Redskins showed, he could be outstanding on occasion, but injuries were a chronic problem.